I'm squeaking in tonight to post this. I have 2 things to share with you today. I thought someone as special as Eula deserved a special bouquet so I chose my favorite floral stamp, The Stipple Rose - retired from SU. I stamped the image in Tuxedo Black, water colored the image in Derwent watercolor pencils in Sap Green and Crimson Lake. I masked it off with a oval mat and chalked the remainder of the base in Creamy Caramel. I matted it with Certainly Celery and accented it with Red Seam Binding Ribbon (SU). 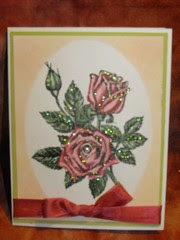 As a finishing touch, I added iridescent Stickles for a little sparkle. I need to write a brief note to Miss Eula, telling her a bit about my life in the Ozarks then it's ready to mail. 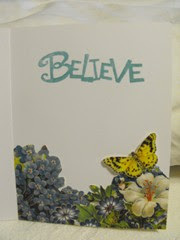 Yep, although it is late afternoon I do have a card for this week. As I told you a few weeks back, I'd selected several 'inspiration' items from the 2005 Take Ten by Stampington. This week I combined MM with my SCS August Challenge envelope from Shell. Shell's items for us to play with were some stamped images from Clear Dollar Stamps, a couple of mats of DCWV Blossoms and Butterflies paper and embellishments. I decided to get ahead of the game and get my daughter's birthday card done ahead of time. Sometimes I manage this better than others. 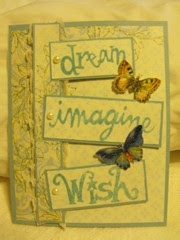 My inspiration card is by Jenn Mason. Her concept was Gifting in Ten Minutes... cards that include either a handmade postcard or a gift card. I'll be including a Starbucks GC in my daughter's. Although she isn't a big fan of pink, the color lent itself to the paper I had to work with. She'll live through one year. With a new baby girl due in just 4 weeks, it's not the only pink she's seeing these days. You'll find a link to Jenn's website HERE and a link to her BLOG For Birthday Kitty, she used a beautiful image of a cat with a birthday hat from Lost Coast Designs stamped to the far right of a tri-fold card. 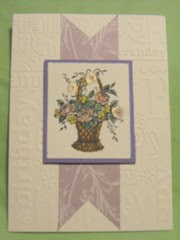 She also used ribbon/ bow to attach the mat on the front of the card bearing the sentiment. I went girly and simplistic with mine. With my daughter, the less froo froo the better. 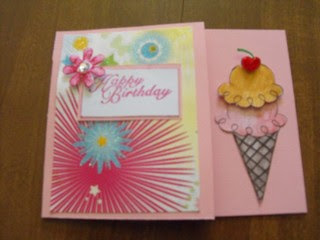 Because I know this is not a 'keeper' card, I used ValuCS in Baby pink to go with the DCWV DP. I cut the 2 scoops of ice cream apart and popped the caramel scoop with 1 pop dot and the cherry with 2 pop dots. I also added red stickles to the cherry. 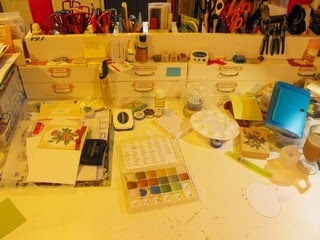 The grandtoddler is here this week so I don't see a lot of stamping going on. Well - except for her. She picked out 3 of her own stamps at Michaels yesterday and was stamping with Grandpa before bedtime... and again right after breakfast this morning.